I am a gardener and photographer living in Grimsby Ontario. I've been speaking to horticultural societies and garden clubs since 2009, when I started my second career in Photography. With an IT and management consulting career of more than 30 years, I am comfortable with public speaking and enjoy it. I bring enthusiasm and energy to well-organized presentations that have interesting themes and lots of quality pictures. While I don't jump up on the stage like Paul Zammit, my passion and commitment to gardening and photography is clear. The Evening Garden - NEW! If you live within the Golden Horseshoe and surrounding Toronto area, you can visit more than 30 public gardens within easy driving distance. Get your schedules out, because you'll want to get to these glorious gardens that are right in your backyard. 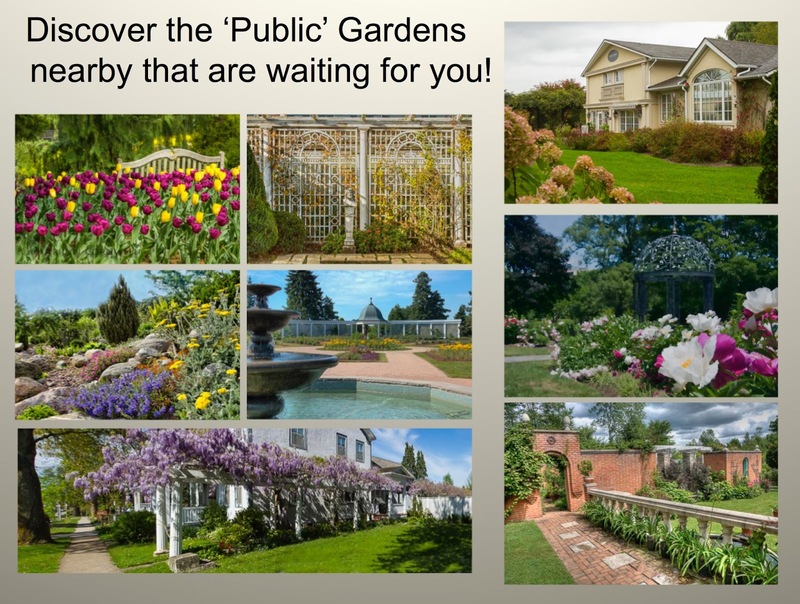 Join garden explorer/photographer Marilyn Cornwell to get the inside scoop on some of the top North American gardens. 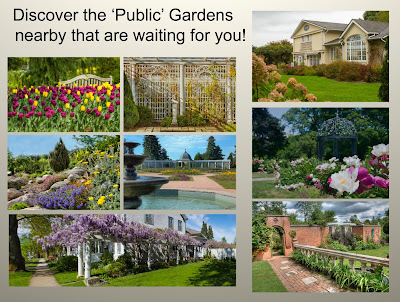 You will visit some of the great gardens of the world through stunning images and stories and you will get the inside scoop on how to plan and undertake your next garden adventure in southern Ontario, Canada or abroad! Learn the A to Z of making sure your garden visits are great experiences! Join garden explorer and photographer Marilyn Cornwell to experience what makes a garden have magic and mystery. She takes you to great North American public gardens showing you how they bring secrets, deception, fantasy, surprises, the surreal and the spiritual to the garden. Special gardens such as the Chihuly Garden, Bok Tower, and Marie Selby Botanical Garden have magic and mystery elements. There are deception gardens at Longwood and Winterthur. The Aga Khan Garden, the Getty Museum and Walt Disney Concert Hall all display surreal and spiritual gardens. This is a complex garden element and aspect - so you will find out what makes for magic and mystery in the garden, and how to make it come alive in your garden. Find out the tips and techniques of floral and garden photography and enjoy photographs of beautiful flowers and wonderful gardens along the way. A variety of sizes and types of gardens are included. Included is my own garden story with my Toronto garden’s antique conservatory greenhouse shown through the seasons. There will be tips and techniques of floral and garden photography. Are you looking for a light-hearted stroll through Christmas gardens and traditions? Christmas is a festive time – lights, wreaths, and the glorious Christmas tree. It has splendid garden traditions and we’ll get a peak into the Wow Experience of Longwood Gardens as well as the exquisite conservatory displays near you. You will find out some of the unusual and humorous traditions and perhaps there are some ideas to take home! Experience all there is in the Romantic Garden. Become aware of what makes a garden truly Romantic. 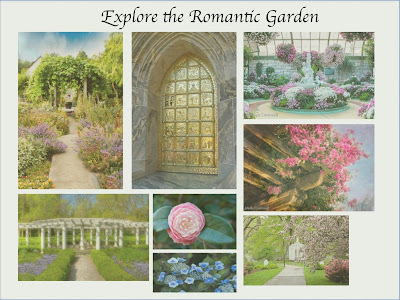 Visit some of the great Romantic Gardens of North America. Dig deep into the elements of the Romantic garden - from exquisite flowers such as roses, lilacs and lilies, to the alluring path and the rendezvous setting. See examples of Romantic elements in small, personal gardens and take lots of ideas home with you. "Our photo contest entries increased dramatically with a noticeable difference in quality"
She was excellent: I'd say one of the best speakers we've had over the course of this year"
"Just wanted to tell you what a fantastic job you did on your presentation at TBG today—your pictures as always were so beautiful and inspiring—and romantic I should add." "My head was full of beautiful images of soft pink,white and blue. I enjoyed your presentation, and had my chilly winter spirits lifted by your amazing photography. So beautiful!" "Thank you very much for a fantastic talk on Wednesday. You transported us to beautiful, warm, inspiring places through your witty discussion and gorgeous photographs! I hope that you will agree to speak about another topic in the future." "Yesterday I was out taking photos with a whole different approach and am pleased with the results. I know our photo competition entries will be greatly enhanced by your wonderful pointers." "Thanks also for a wonderful trip thru the many beautiful gardens. We had 78 visitors, usually about 50 come now a-days. The comments were all positive. April 2015." My Grimsby garden was on the Toronto Botanical Gardens day trip to Niagara. My garden was included in the Grimsby Garden Tour.